Manuel surely got lucky this year! Kaylie made him a mouse pad at school & got him a red XBOX360 controller & a Daddy’s Girl picture frame. 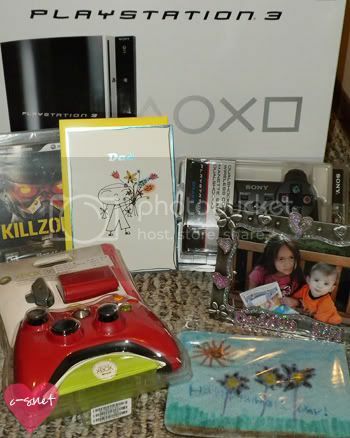 I ended up getting him a PS3 which came with a free extra controller & bought KillZone2 for it. I didn’t want to spend $400 but figured it’ll be his Father’s Day & Anniversary present, hehe~ Our 4yr wedding anniversary is in 4 days. So I’ll begin by listing off what’s been going on lately..
Beginning last Monday until August I will be working 7am – 2pm. Which means for most of the summer I’ll be off by 2pm!! The school that I work at needed to cut back on hours since we will not have full enrollment for the summer. My class (age 6wks to 2yrs) will only have 4 kids instead of the usual 12 for the entire month of July. This means I will be by myself all day with the kids. Cutting two hours a day does add up money wise which means my paycheck will be around $300 short!! To make up for this I will be working an hour most mornings at my other job (5:15am – 6:15am) to help relieve some of the lose. Plus I can pick up extra hours in the evening if I want. I had my last official class yesterday for my Montessori Teacher Training. I so did not want to get up at 6am on a Saturday, believe me! My practicum will begin in September which means I’ll have to go to meetings one Saturday a month until May 2010. My graduation will be in June 2010!! In August I’ve decided to take a Digital Photography course at the local community college for the fall semester. I’m going to hold off on Japanese until the Spring. I figure since I take so many pictures that I can immediately use what I learn from the course. I’m really excited & wished it started sooner. 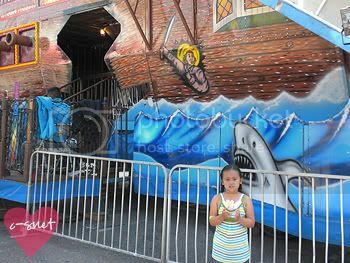 Last Sunday Manuel’s grandma & I took Kaylie to the annual carnival that’s in the city I work. It was super small so we were in & out in 20 minutes, hehe~ Kaylie made me go on this pirate ship that rocked back & forth and made me sea sick!! I felt so queasy on it & even afterward when we were at Target! About two weeks ago Manuel was working in chinatown in San Francisco & picked up a few things for Kaylie & me. I adore my owl sake cup & the tenshi neko tote is oh so cute!! I’ve been doing pretty good about not getting a fever back, haha~ I try really hard to drink enough water during the day but I’m not getting quite enough. All I’ve been drinking is water but it’s about 1/2 of the 8 glasses a day I’m suppose to have. Last week I bought some Country Time Lemonade packets to add to my water since I’m getting pretty bored with no flavor. It’s helping! 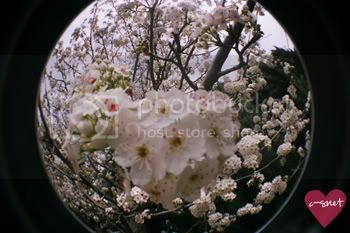 I developed three rolls of fisheye film and was only able to get one roll onto flickr. I’m hoping this week I can get to the rest of them. I really love the cloud shots & can’t wait to upload them. I’ll be graduating in 2010 as well! But I’m pretty sure yours is more of an accomplishment haha. I’ll just be graduating with my GED. GO FIGHT WIN! OWL! I want one~ Is it a cup or just something to throw random things into? I’m glad your health issues are improving! And that season pass sounds like a really good idea. A water park sounds lovely in the summer! o_o; at your emails… I complain when I have only 20 emails to sort through, haha. I don’t know why I was so amazed by the mouse pad Kaylie made. Maybe it’s just so high tech compared to the projects I did in elementary school for my dad. Paper tie, paper lunch bag with cookie inside, paper cup, paper hat…lol. I love your owl cup. Now I want to run down to Chinatown and find me an owl cup! Hahaha…. You have a lot going on! Woah! I still can’t believe you have to work at your other job that early in the morning. How do you survive that? looks like you got yourself some nice stuff! We’ve all been fighting a fever as well. A lot of my friends are sick as well as myself and my boyfriend. We thought it was from the wedding we went to because everyone who was there with us is sick, but who knows? I hope you start to feel better soon! Also, the diet snapple water things are good too. The pink lemonade one helps me get my water down. Happy belated anniversary!! Manuel made out like a bandit this year. So did Kaylie. I’m glad you guys had fun at the amusement park. The pictures are really cute. Well; I don’t know what else to say so I guess I’ll stop it right here. ooo and i forgot to say!